I used to work near Bugis, and the one constant struggle I had was deciding what to have for lunch every day. It’s no joke — I had to consider how cheap or expensive it was, how filling it’d be, and whether it’d be crowded especially at noon. For me, Supreme Pork Chop Rice was a huuuge hidden gem because of its yummy and value-for-money Taiwanese pork chop rice sets. For a mere S$4.50? Yes, please! 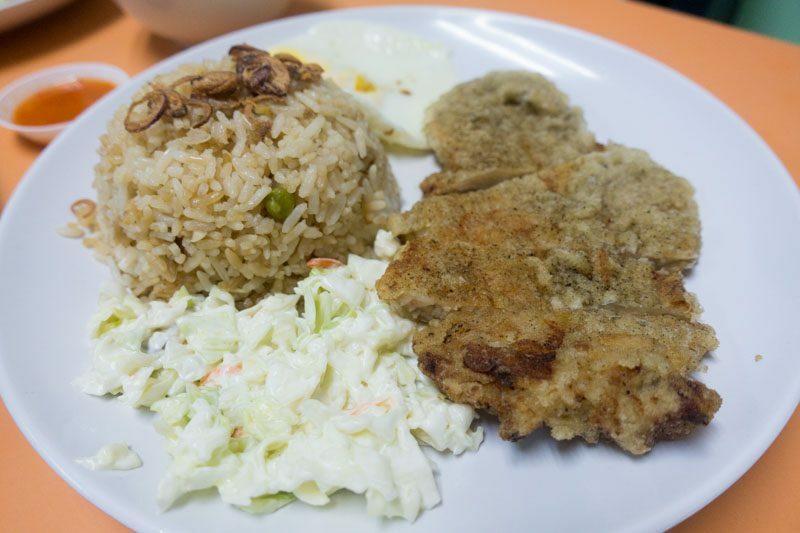 Located at Bulkhaul House, which is located at the junction between Beach Road and Middle Road, Supreme Pork Chop Rice can’t be missed. A huge red signboard carries its shop name and during peak hours, you can spot crowds of office workers trail past glass doors and down a flight of steps into a basement coffee shop. 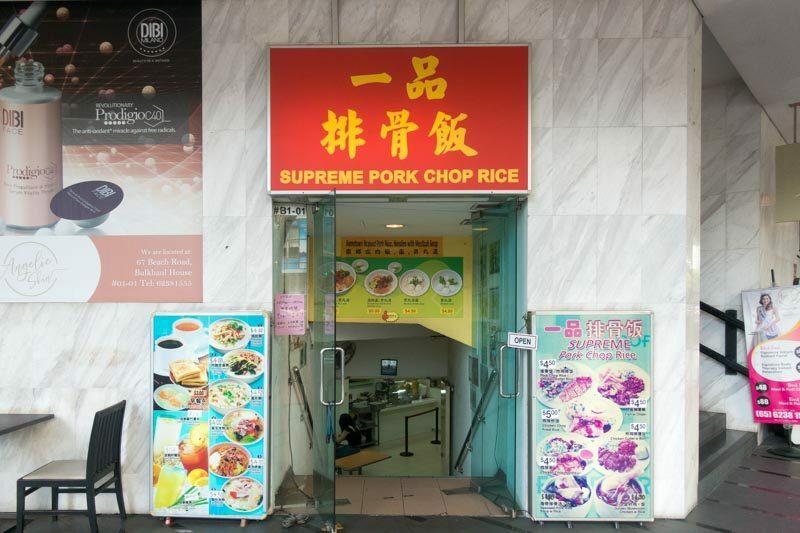 Supreme Pork Chop Rice has had a long history, dating all the way back to 1995 when it was first located at Victoria Hotel’s food court. 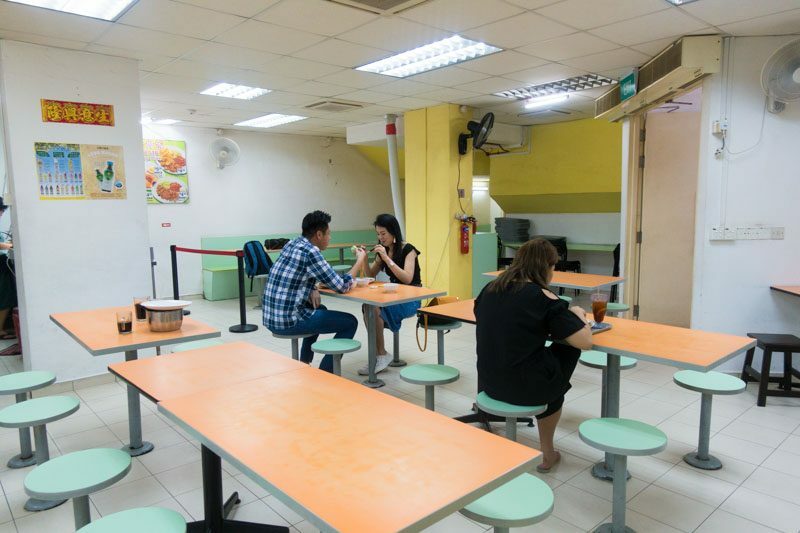 It has moved a couple of times since then, notably to Shaw Towers Food Court and then Bras Basah Complex Food Court, before settling down at Bulkhaul House. 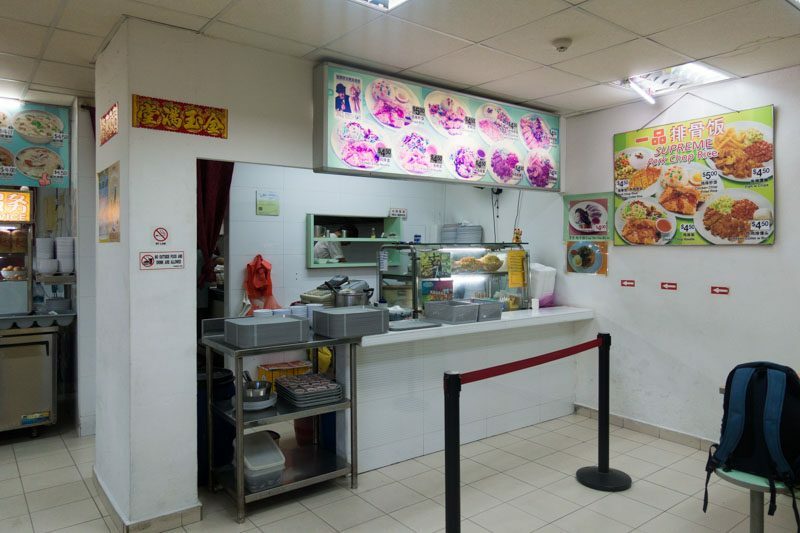 Despite its simple store front and menu, its repeat customers are plenty, having tracked this humble shop across the years and flocking to it for its signature pork chop rice and other value-for-money sets. When we visited Bulkhaul House, it was during off-peak lunch hour and the crowd was sparse. Despite so, the basement food court was already incredibly hot (especially with the afternoon heat) with only rotating fans to keep the air from becoming stuffy and stagnant. I can’t imagine how the heat would be during peak hour traffic. I was told that there would be snaking queues even before the clock hit 12pm! Perhaps it’d be wiser to tapau this back to an air-conditioned office, rather than sit in a stuffy basement with a dense fog-like heat wave. Given the raving reviews, I was pretty excited to try its signature Pork Chop Rice (S$4.50). I was given a plate of fried rice, crispy pork chop, an egg, coleslaw, and a bowl of cabbage soup. I’ve got to say, the Taiwanese-style pork chop was really addictive. It was covered with a thin layer of flour, fried till a delicious golden brown, and topped off with a generous seasoning of pepper, cinnamon and spice. Every bite was crispy, piquant and savoury, and I especially loved how it was fried upon order so each bite wasn’t soggy and overly oily. My only gripe would be that the meat itself was quite dry. 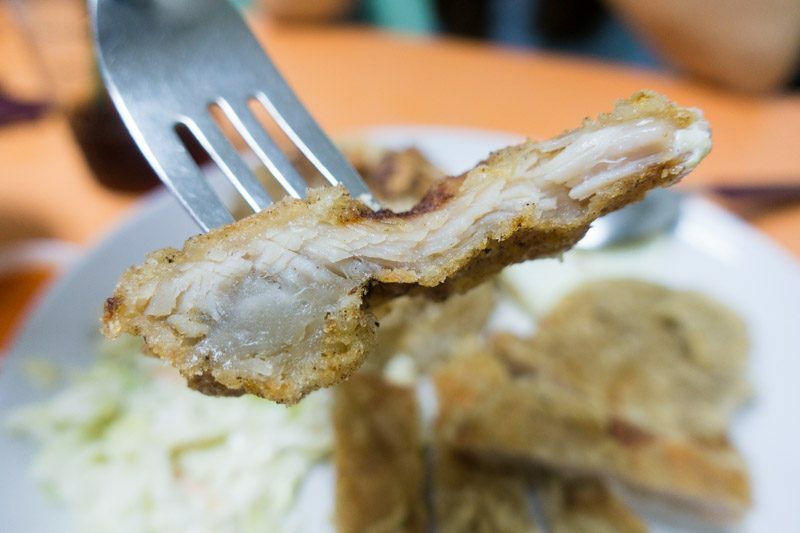 Perhaps that was because my particular cut of pork chop had more fried batter than meat. 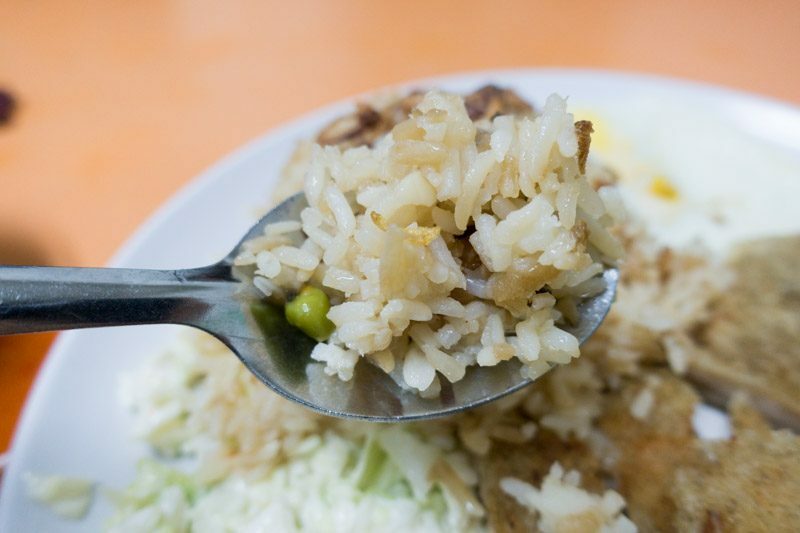 The Pork Chop Rice came with a mountain of fried rice, which was littered with onions, egg and peas. While there was a strong garlic and soy sauce taste, the rice was dry and it was obvious that the peas were frozen prior to being cooked. There wasn’t enough seasoning to make the rice flavourful and it ended up tasting bland. 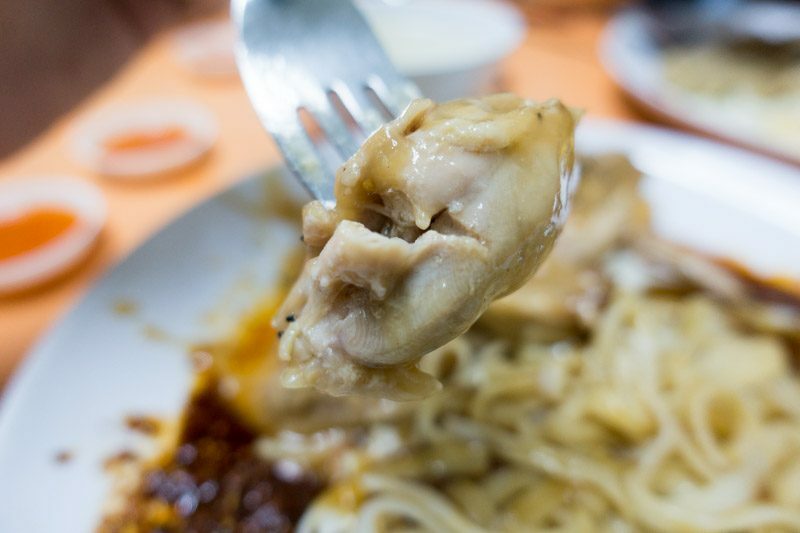 I also ordered the Chicken Chop Noodle (S$4.50). 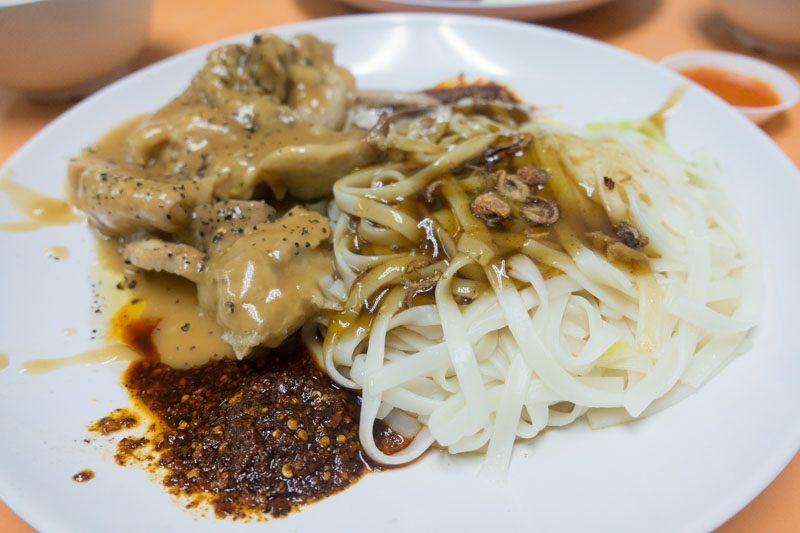 It came with a large pile of kway teow noodles topped with brown gravy, cubes of grilled chicken doused in mushroom sauce and a large spoonful of chilli oil. This was by far my favourite carb dish. As compared to the dry fried rice, the noodles were silky smooth and delicately thin. 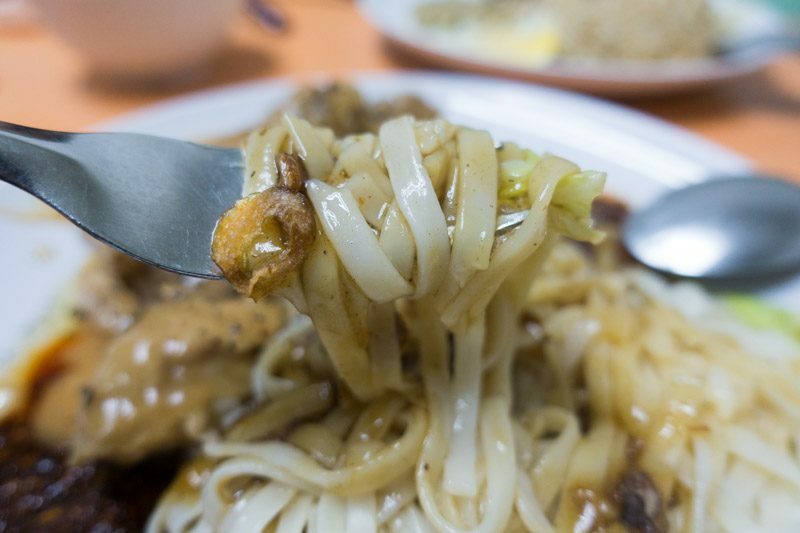 While I couldn’t identify what went into the brown gravy, it tasted rich, salty and slightly earthy, like a mix between oyster sauce, mushrooms and dark soy sauce, and the fried shallots made each bite fragrant and nutty. The chicken chop was pretty nondescript. While the juicy pieces were grilled nicely and had a slight smokey flavour, the thick mushroom sauce overpowered everything else and all I could taste was the rich creaminess from the sauce. What I did thoroughly appreciate though was how the chicken chop was already cut into bite-sized pieces, so there was no need for me to take an extra step of cutting them up prior to popping them into my mouth. What I absolutely loved was the chilli oil. It might look lethal, but the chilli oil was delightfully peppery and spicy. 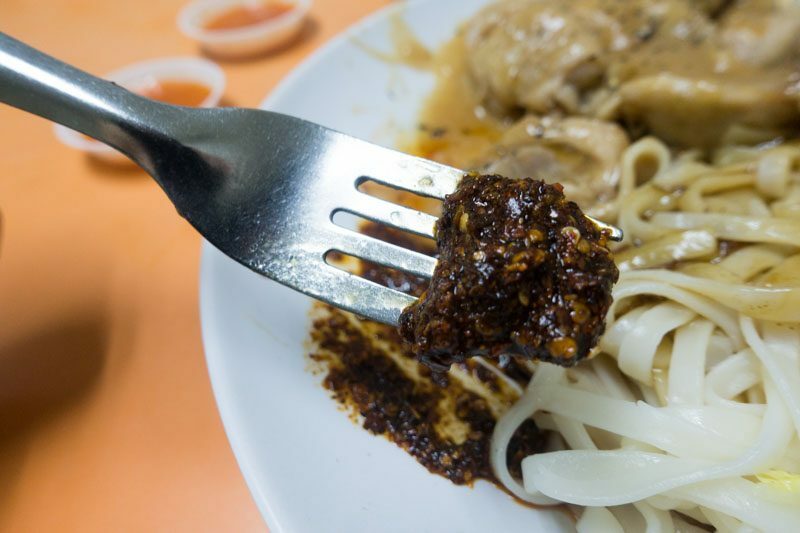 It delivered just the right amount of heat to leave your tongue slightly numb, but was piquant enough to add a smoky touch to the noodles and chicken chop. I ended up mixing the chilli oil right into the noodles and it was so good that I went back to the stall for seconds. If you’re a chilli fan, save the extra journey and simply ask for extra chilli upon ordering. 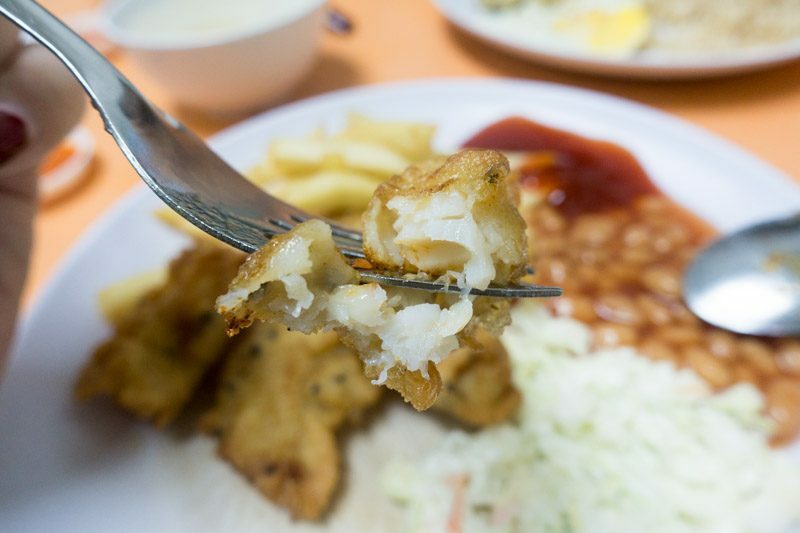 The last dish I ordered was the Fish With Chips (S$4.50). 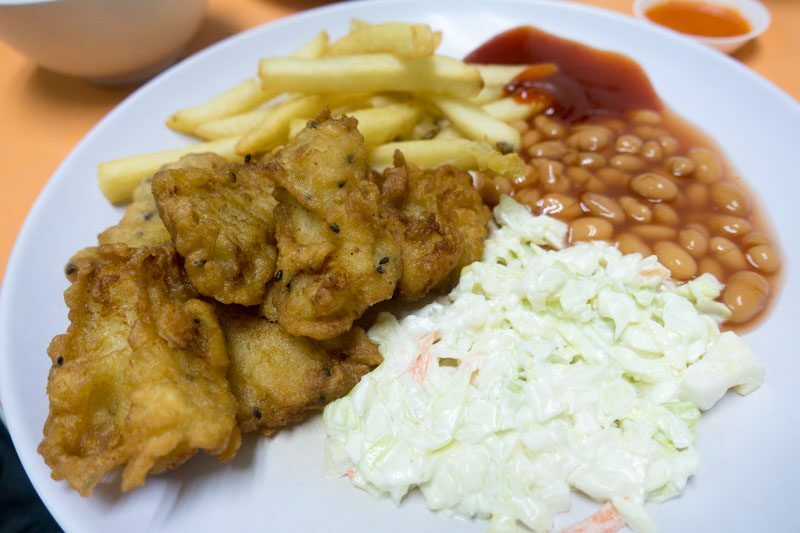 It came with bite-sized pieces of fried fish, french fries, coleslaw and baked beans. The hero of this dish has definitely got to be the fish bites. The flour batter was thankfully thin and there was an audible crunch when I bit into them. What I particularly liked about it was that it was deep fried upon order. As compared to other Western stalls (or even fish soup stalls) that might leave the deep fried fish bits stacked sky high for the entire afternoon, resulting in soggy fried fish with an unpleasant “smelly” oil aftertaste, I could tell that the oil used by Supreme Pork Chop Rice was fresh. The fish meat itself was soft and sweet, and each bite was simple, fragrant and indulgent. The coleslaw was pretty well done too and I appreciated that it wasn’t doused in too much cream. 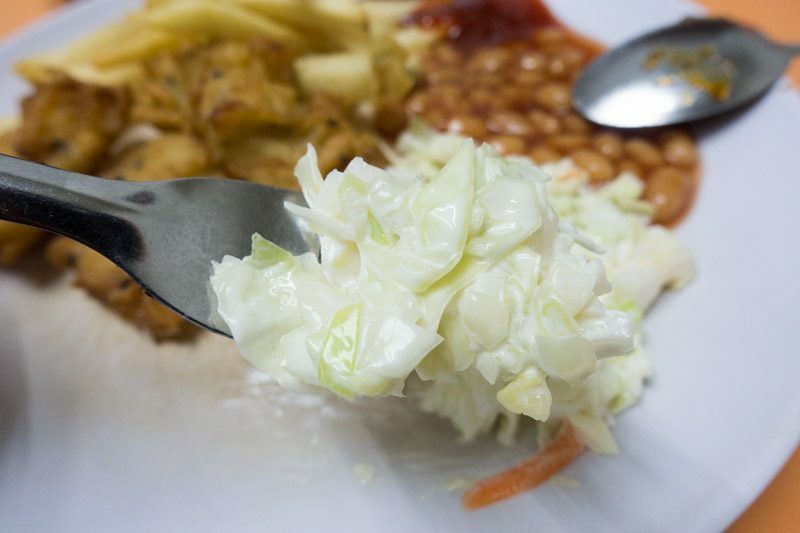 Instead, the crunchy cabbage was coated in a thin layer of refreshing mayonnaise. While the coleslaw was definitely more on the watery side, I liked that its lightness complemented the heaviness from the fried batter, and I could also taste a tinge of zesty lemon, which helped to whet my appetite. There’s no doubt that all the meals here at Supreme Pork Chop Rice are definitely worth its price. It serves large portions of indulgent fried pork chop, fish nuggets and grilled chicken chop for below S$5, and each meal also comes with a decent amount of carbs and side dishes. There are hits and misses with each dish, but I wouldn’t complain given its cheap price tag. Plus, while I wouldn’t sit down for a meal at Bulkhaul House given how stuffy it is, I’d definitely be up for tapauing a packet of Pork Chop Rice (and perhaps swap out the rice for noodles) back to my air-conditioned office for a good ol’ relaxing lunch break.